The Nova Scotia Department of Natural Resources is developing an ecosystem based management planning system, as outlined below and organized in the linked web pages. A detailed overview is presented in the report "Implementing Ecosystem Based Integrated Resource Manangement in Nova Scotia"
Forest ecosystem based management provides a holistic way of managing resources with emphasis on the natural environment. In addition to producing traditional resources, forests are part of the provincial identity and supply great social and environmental wealth. These values are all produced by healthy functioning ecosystems. Ecosystems, with their focus on interconnectedness, describe the fundamental units of nature and provide a logical framework for understanding, planning, and managing natural resources. Ecosystem based planning takes its cues from nature, adopting a habitat based approach to conserve biodiversity and productivity by maintaining natural conditions and processes. True to ecosystem complexity, Forest Ecosystem Management (FEM) operates at multiple scales and incorporates components from several organizations and programs. 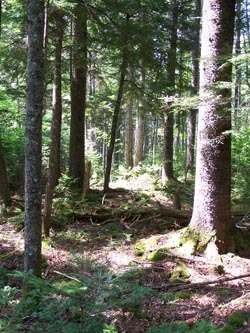 The Ecological Land Classification (ELC) for Nova Scotia provides a hierarchical mapping of the province's forest ecosystems. This includes interpretation of the dominant natural disturbance regimes and potential climax forests at the ecosection level of classification. Nova Scotia's Ecological Land Classification is available on-line both as a component of the Provincial Landscape Viewer web map or downloadable digital database. A pdf report is also available. The provincial Forest Ecosystem Classification (FEC) provides a site level description of ecosites, vegetation communities, and soil types designed for operational level planning. FEC is the stand-level extension of the ELC.